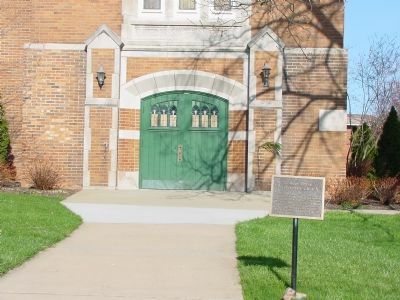 This congregation of Scotch-Irish pioneers was first gathered at Crooked Creek in 1806, and organized in 1812 as the Crooked Creek Associate Reformed Church. The congregation moved to this site in 1858 and was reorganized as the New Concord United Presbyterian Church. This building was erected in 1922. Location. 39° 59.67′ N, 81° 44.098′ W. Marker is in New Concord, Ohio, in Muskingum County. Marker is on College Drive north of West Main Street (U.S. 40), on the right. Touch for map. Marker is in this post office area: New Concord OH 43762, United States of America. Touch for directions. Other nearby markers. At least 5 other markers are within walking distance of this marker. Muskingum College (within shouting distance of this marker); New Concord War Memorial (about 400 feet away, measured in a direct line); New Concord (about 400 feet away); Robert Francis Harper (about 400 feet away); William Rainey Harper (about 400 feet away). Touch for a list and map of all markers in New Concord. Regarding College Drive Presbyterian Church. 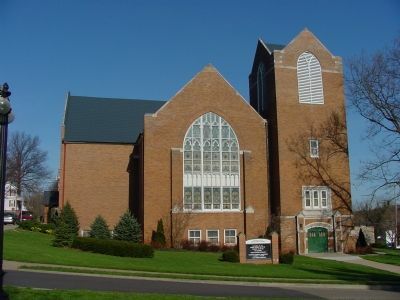 Astronaut and Senator John Glenn, Jr. married his wife Anna Margaret Castor in this church. He is a church elder. More. 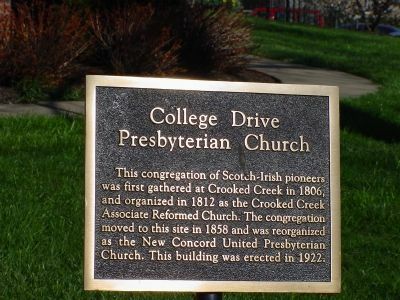 Search the internet for College Drive Presbyterian Church. Credits. This page was last revised on June 16, 2016. This page originally submitted on April 19, 2006, by J. J. Prats of Powell, Ohio. This page has been viewed 2,036 times since then and 5 times this year. Photos: 1, 2, 3. submitted on April 19, 2006, by J. J. Prats of Powell, Ohio.